Situated on the Gulf Coast of Florida, The City of Palms is known for year-round sunshine and sprawling stretches of white sand. 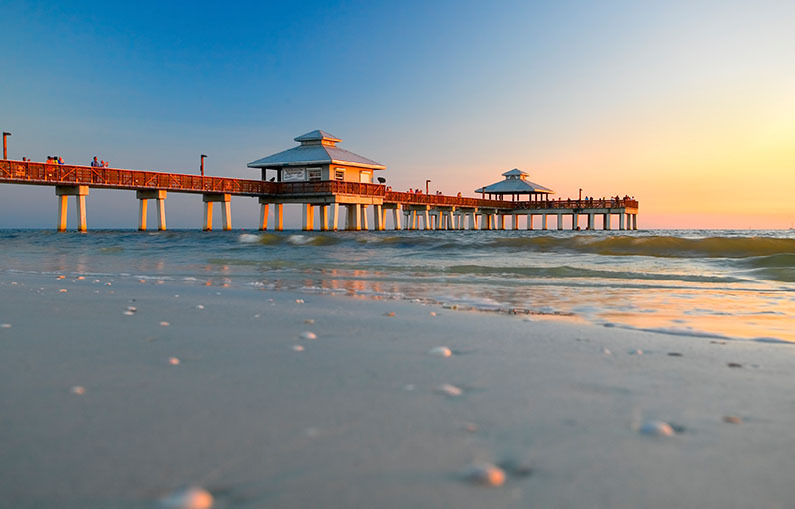 A destination for golfing and deep-sea fishing, Fort Myers exudes the relaxed atmosphere found most easily on the beach. Between Captiva Beach, Tarpon Bay Beach, Cayo Costa State Park, and many others, the Fort Myers beachgoer is not without choices. Each offers a different experience, and depending on your interests (swimming, relaxing, water sports), each can adapt to fit your vacation style. Take a walk along Six-Mile Cypress Slough Preserve and discover the wildlife of western Florida. The guided tours are led by volunteers, and serve as a great resource. Otherwise, you can explore the route solo; the nature will follow you down the path either way. With white ibises, gators, and sea turtles about, you never know what you might encounter on your stroll. Once frequented by Thomas Edison and Henry Ford, the Edison and Ford Winter Estates are now open daily to the public. The two visionaries were great friends, and spent their winter vacations as neighbors on a pristine stretch of Fort Myers soil. Today, visitors can explore Edison’s laboratory and the meticulously planned gardens, an up-close interaction with the past. Home to Florida’s Gentle Giant, Manatee Park serves as a warm-water refuge. When the gulf’s temperatures are low (especially during the winter months), you might just spot a manatee or two in this open stretch of sea. The area also makes way for a massive butterfly garden, further honoring the wildlife of western Florida.